Wow! 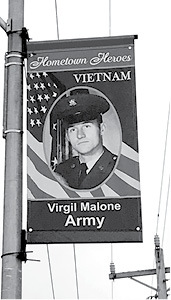 As I was driving through town Sunday after church I was pleasantly surprised by the “Hometown Heroes” banners that were displayed throughout our town. I swelled up with pride as I passed each one and tried to read the name on them all. I noticed my cousin, Dawson Waid, and as I headed out of town onto Highway 1590 I recognized Ted Aaron and thought how wonderful it was that his was displayed right across the road from his home that he lived in many years. I am very proud to live in Albany, Kentucky and Clinton County and want to say a big kuddos to whoever thought of this idea! It is wonderful and thank you to all who are serving actively and to those who have served in the past, you are greatly appreciated!